It seems that more and more often we find that the food we consume is killing us, thanks to chemical fertilisers and pesticides. There are some that are deadlier than others but continue to be used in India for economic gain. Pesticides along with fertilisers are also responsible for contaminating the environment, particularly surface water, groundwater, and soil. While these vegetables and fruits may be cheaper for the consumer, they can act as a gradual poison for humans that will eventually lead to disease and death. Apart from the obvious use of chemicals as pesticides and fertilisers, we have the additional threat of chemicals being injected and sprayed on fruit and vegetables to lend them a palatable appearance. How do we reduce or negate the threat to our health? 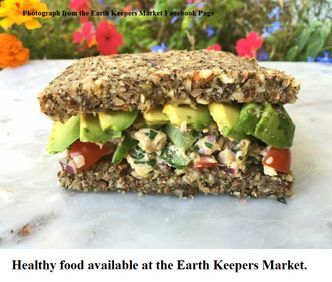 In Goa, we are fortunate enough to have the Earth Keepers Market, which is purposefully set up to build people’s awareness of organic and healthy choices in life. In this way, the market is able to promote the protection, conservation, and regeneration of our environment and to prevent the destruction of Mother Earth. The vendors and hosts of the market consists of individuals who are actively working to change the world, so that people can lead more fruitful lives and achieve their full potential in contributing to the planet. The market also serves as a networking point for like-minded persons to exchange ideas on organic produce and derivatives, health, and the environment. 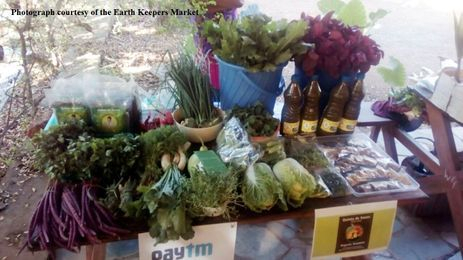 The journey of the Earth Keepers Market began with the first market being hosted in March 2015 by Minakshi Singh at the Manashanti Healing Centre in Paithona, Porvorim. This was held as part of the Earth Keepers Movement in Goa, initiated by Darryl D’Souza, the president of The World United (TWU) Goa. TWU Goa is an organisation that has been doing work on health, nutrition, the environment and self-empowerment since 2012. As the market failed to receive traction after a few sessions in the isolated locality of Paithona, Darryl launched a second edition of the market in June 2015. It was hosted at 3 locations: The Rejuvenation Center in Candolim, Saraya Ecostay in Sangolda and The International Centre in Dona Paula. This time, Goans responded with greater enthusiasm owing to the accessibility of these locations. The market was held at each of these locations on one Sunday of the month. A year later it was also started on one idle Sunday at Happy Home in Assagao, run by the NGO Live Happy. The earth has been ravaged for long enough, and it is time we began setting the situation right. This would, of course, begin with the world’s most important profession of farming. Therefore, the Earth Keepers Market hosts farmers who sell produce that is free of chemical fertilisers and pesticides. This means the fruit and vegetables and other farm products are entirely eco-friendly and organic. The fruit and vegetables available include banana, papaya, pink radish, Malaysian spinach, turnip, tendli (ivy gourd), waterleaf, pumpkin, tambdi bhaji (amaranth), bottle gourd, brinjal (aubergine), tomatoes, cabbage, cauliflower, string beans, and white radish. Rocket, spinach, ajwain leaves (carom), basil, romaine lettuce, radish leaves, brown rice, gluten free flour, millet, lentils, and spices are available too. With richer nutrients and antioxidants, organic produce is ideal for people who are prone to allergies to synthetic chemicals. Apart from the produce, other items sold at the market are seeds, seedlings, and saplings for those with green thumbs and the desire to grow their own food, and fresh food and juices that are perfect for vegans and vegetarians. Other environmentally friendly products that can be found at the market are chemical-free pest repellents, hemp bags, recycled products made by underprivileged women and children, quilled products, and household cleaning agents, body soaps, beauty products (mud masks, lotions, body sprays, etc) that are made from organic ingredients and can be used without the threat of harm. Healing herbal teas and oils, massage oils, organic honey and local cottage industry products are obtainable here as well. 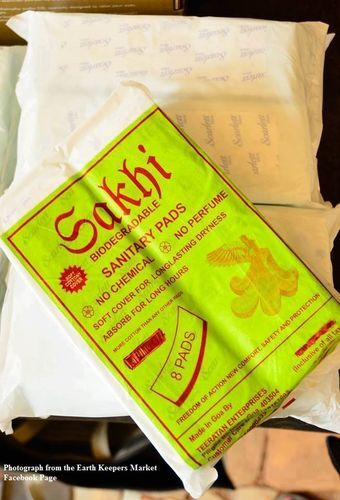 For all the ladies worried about the impact of sanitary pads on the environment – you can prevent an addition to landfills and the pollution of water bodies with toxins and plastic with the use of Sakhi biodegradable, perfume and chemical free sanitary pads. 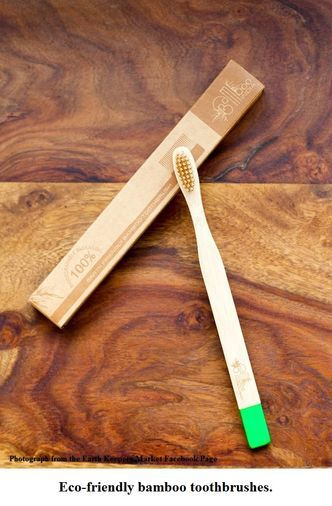 Bamboo toothbrushes, combs, soap dishes and paper straws are on sale to alleviate the ever-growing plastic problem. ‘R’ Handmade Paperworks’ stationery that has been made from recycled material and Narla’s handmade products derived from coconuts like coconut vinegar, gluten-free coconut flour, tender coconut soaps, decorative items and food bowls derived from coconut shells, can be bought at the Earth Keepers Market. 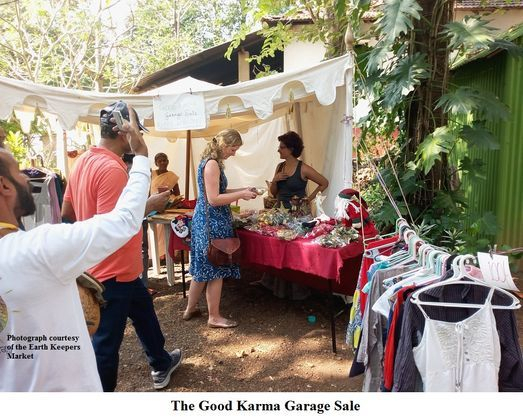 2017 saw the addition of The Good Karma Garage Sale to the Earth Keepers Market as a reminder that one way of saving the planet is recycling and reusing products like clothes, bags, shoes, accessories, books, toys and home decor. The money from the sale of these donated items would go to various charities and organisations involved in saving the planet and making the world a better place. A Christmas special Earth Keepers Market was held at Shala 142 in Assagao, in December 2017, where slightly used bags, Christmas décor and shoes were sold through The Good Karma Garage Sale with 50% of the proceeds going towards STARS (Sterilize Treat And Return Strays). There is a space called Darya Dil Dukan at the Earth Keepers Market, where one can drop off any useful items that one does not need. These extra items remain in the Darya Dil Dukan to be picked up by those to whom they can be beneficial. The Earth Keepers Market has had, additionally, movie screenings of select films that are thought provoking. Musical programmes have been part of the market as well, the most recent being the Listening Room by the music collective REProduce Artists (Delhi based) held at Saraya. Counters with detox therapies, energy healing and cleansing, angel card divination, flower remedies, healing crystals and malas, and acupressure body diagnosis and healing are accessible for those interested in alternative healing methods. The market has seen its ups and downs over the last 3 years, but it has not failed to keep chugging on like a train that just cannot be stopped, thanks to the zeal of its vendors and its venue partners. The third edition of the market now happens every Sunday evening from 5pm to 6pm at The Rejuvenation Center in Candolim (office of Earth Keepers Connect, a global organisation founded by Darryl D’Souza), and on the last Sunday of the month from 4.30pm to 7pm Saraya Ecostay in Sangolda. For directions and more information, you can call 8888409687.